Going over a jump is one of the obstacles in the Horse Agility competition. The handler has the option to jump with the horse or they can go along side of the jump. The handler and the horse should pass over the jump at the same time. To prepare your horse for jumping In-hand you should start out with them going over ground poles first. After they are confident with that the cross rail jump will be the next step up. 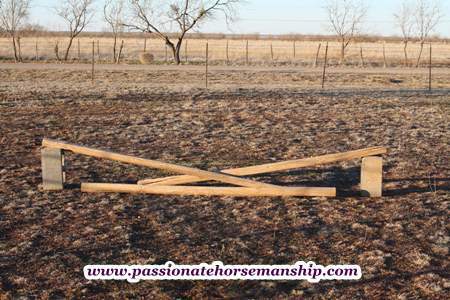 Using a cross rail jump focuses the horse towards the center as it is lower and it will also build their confidence. You can set the jump up using concrete blocks like you see in the photo above or you can set the poles on buckets. The poles I’m using are called “Landscape timbers” which I got at Lowe’s. I like using the landscape timbers because they are flat on 2 sides so they stay in place better. Jumping a horse In-hand can be challenging but with the use of Clicker training it makes things easier as the horse will offer to jump on their own. When they jump on their own this also builds their confidence as it is their idea and that is why I love clicker training, it is a powerful communication tool. Want to get started with Clicker training for your horse contact me today to setup lessons or get signed up for my online courses.